Today, May 16, 2014 marks 50 years since my sister Paula died. I was inside my mother’s womb three and a half months from being born on that day. In this picture I am somewhere between two and three. My sister died three months short of her second birthday. Her death has marked my life as well as the lives of all our family. Death is a certainty for all of us, but no one wants a child to die or expects it. I am truly a child of death, born into the grieving arms of my amazing and brave parents, who had to find love and presence to give me while being devastated about the loss of their firstborn beautiful child. Every year at this time I light a Yahrzeit candle for her and remember her physical presence on this earth. This Jewish practice is so important to me and gives me a comfort that is beyond words. I feel connected to my sister across time and space and I remember her and honor her and recognize that her short time on this earth was real and deserves honoring. 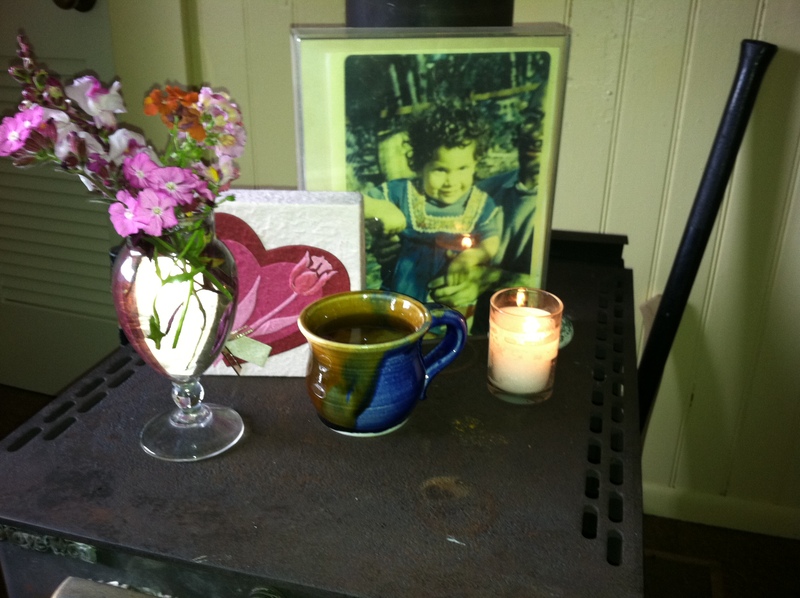 Yahrzeit Candle and memory altar for Paula on anniversary of her death. My parents have gone through various different ways of mourning her over the last fifty years. There is no way to navigate the territory of the death of a child right or wrong. It is all wrong. Everything about a child dying feels wrong and those who have to cross that territory know this in a way that others who have not cannot really speak to. I have not lost a child to death and I pray I never do, but that is not within my control. Death is a certainty, there is no way out of it. The mainstream culture runs kicking and screaming from this reality, racing as fast as they can from the idea that we all have a date stamp on us, one that we don’t know and cannot see. If you are a practicing Buddhist, you spend a very long time imagining and looking at your own death in all kinds of different scenarios. If you are a Tribally aligned person, from anywhere around the globe, you recognize that the spirits of those who have died are here on this earth either to help or teach or hinder us based on many different factors. If you are an African Dagara Shaman like Malidoma Patrice Somé , you have a frame-work of belief that holds you, as the progeny of an ancestor, responsible for their wrong actions and the beneficiary of their good actions. If you are Hindu, you are engaged in a circle and chain of lives lived across space and time over and over in various forms. If you are Mexican you will make a feast and an altar of memories and offerings for your dead once a year and recognize and remember them together. Here, we just foolishly hope death will go away and try to avoid the topic. I’m summarizing very deep and profound beliefs here and could write many long essays on each of these, and perhaps I will, or as we say in my tradition, “go and study.” If something here stimulates you to learn more or go deeper, maybe even into the burial root ground of your soul. I have studied and do study death more than most folks in our society. I am a co-founder of our community’s burial society called a Hevra Kadisha. I prepare folks for burial according to Jewish tradition. I have been called by death from within the womb-safe belly of my mother. I met my sister in that liminal space between, before my birth and after her death. She was my angel in all the dark nights of my childhood, a sweet presence that helped me find hope, or pointed out the right direction. I visited her grave as a child and have always held a place for her in my heart. 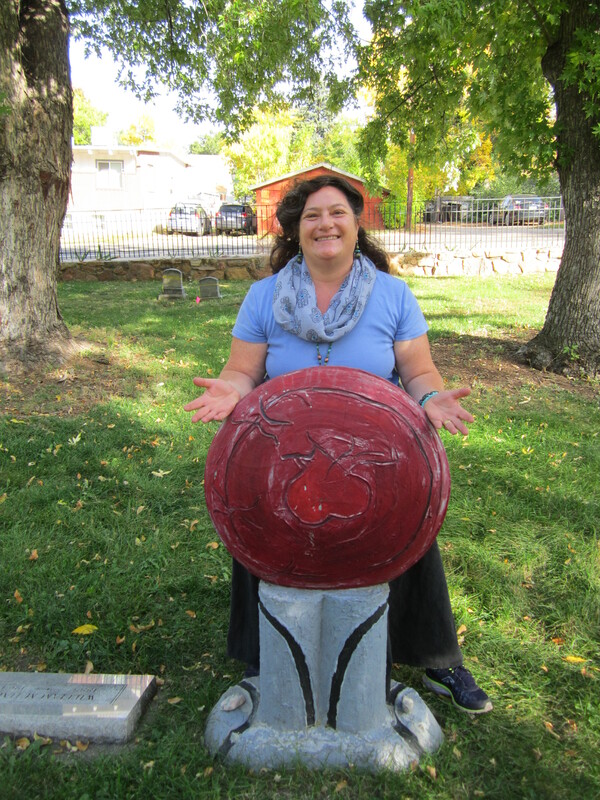 When I was a teenager I would visit the graveyard with my friend Gretchen Reinhardt and we would attempt to rescue or put back together gravestones that had been vandalized. I was never afraid in that graveyard. All those dead were my friends. It was a quiet, calm place where I didn’t have to feel all the pain of those around me. No one was teasing me or hurting me and I never felt like an alien in the cemetery. I was at home there, I still am. Death and I have always been in relationship. Which is why everyday of my life feels like an amazing gift that I need to live fully and well. I am not running away from the knowledge that I will die, that all those I love and cherish will die. I am acutely aware of this and I know it in my cells and in my blood. My umbilical cord blood was saturated with the pain of my sister’s passing, my very core has been colored by her passing. This is not a sad story though, while at the same time being the saddest story. I am more than okay now as I round the corner towards fifty and I pass this spot on the calendar and I touch her once again in the cycle of remembering. I know that there is more to death than an end. I know this in my body, heart and mind, in my Lev (Hebrew for Heart/Mind) and in my soul and it is not just a comfort to me, it is a lifeline and a guiding force in my life. I know this post will make my mother cry, but she and I have a long and deep understanding about honesty and truth-telling and being real with each other. We both have made and will make mistakes, but we are linked so very deeply in our connection to dealing with death honestly and with whatever we have to bring to the table around it. Others in my family do not often want to talk about Paula, but perhaps they will read this or maybe they won’t. My father used to take me to her grave as a child, this was not something I did with my mother. 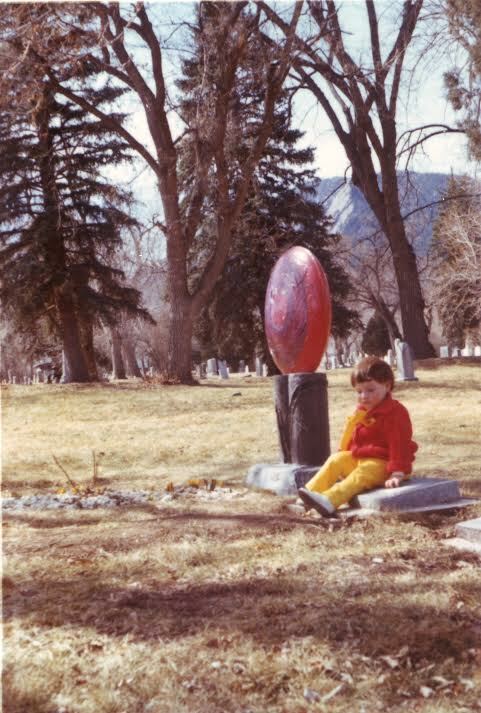 As an adult when I am in Boulder I visit her grave and place a stone on it. Jewish folks bring stones to a grave, stones to mark that our memory for those who have left this earth is as long and durable and tangible as that of a stone or a rock. A rock has been around for millenniums and this symbolic act is our way of saying, “YOU are present for us still today.” It reminds us to do good and enact justice for those who are living. It reminds us to not throw stones, but to remember that everyone is precious and will be mourned by someone, so we shouldn’t go around killing folks EVER! A rock says, I silently mark this territory and bear witness for you, even when you are in the ground yourself, I will still be here as a reminder of your presence on this planet, at this place. Visiting my sister’s grave October 2014, leaving stones and saying prayers and remembering. I have a mother who is an artist and who has been marking my presence and journey on this earth since before I was born into it. She has marked me with paint and pastel, with pencil and with cloth. Reminding me and anyone brave enough to visit this place of pain, death and life that we are always MORE THAN ONE. We are all connected one to the other, now and forever and always and always. I love you mommy and I love you Papa. I grieve for your loss, even still and especially, today fifty years later. Thank you for loving me so deeply and magnificently! 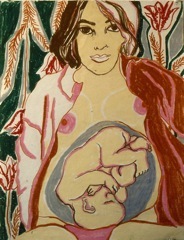 Here I am, inside my mommy, right before I was born, more than one always! thank you for sharing these beautiful, heartfelt thoughts today. This is a beautiful essay Nicole! All through my life, I have heard the story of Paula’s life and death and it has always touched me. In the eight years since I lost my beloved sister, I have found the same comfort in marking her life with an altar and a candle. The work you do now is your legacy in bringing comfort to the grieving. Thanks for writing this, too. I’ve been thinking a lot about my sister who died when we were little, because we are going to visit a place where we lived, where she died. And we are staying a couple of nights near where she was buried. I will put a rock as close as I can get to the place where her body rests now. Come on over to my blog at http://travelsinmybackyard.blogspot.com/ if you want to read a little what I’ve been exploring lately about my sister and our early life. Love and life and death — it’s all good. Deep and rich material….thank you.